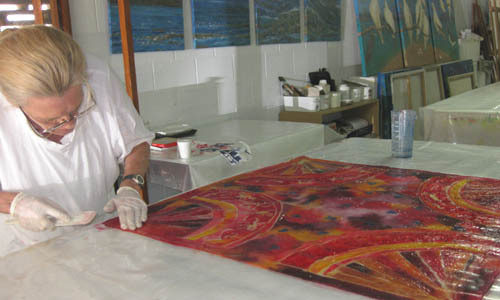 Creative Arts Workshops in Australia - an In-depth Tourism Experience. Not only do creative arts workshops in Australia provide an in-depth tourism experience, they also (obviously!) teach you skills and sometimes help you to get out of your "comfort zone". 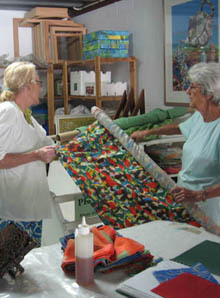 This is a fabulous outcome if you are also looking to explore and enhance your own creativity. 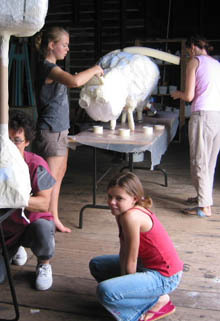 Usually workshops and artists retreats are held over several days or more, developing skills levels in a relatively short time. By comparison, regular classes take smaller steps over a longer period. Both can have a wide or narrower focus so you need to 'shop around' to find what suits you best. Students assemble glass pieces ready for fusing in kiln. 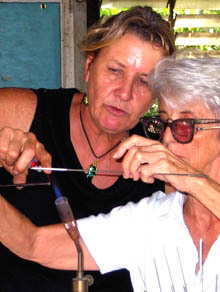 Would you like to learn aspects of designing art glass? 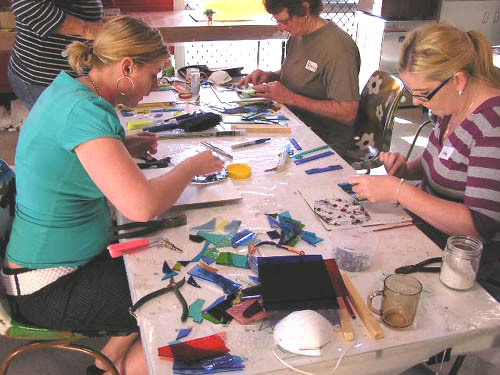 Check out the amazing choices at these North Queensland art glass workshops. To walk in the steps of Michelangelo, write and paint in Marakech, photograph the spirit of Japan or explore colour in Australia, check out past examples of luxury art retreats hosted by world class artists. Or see what is happening on the local scene. 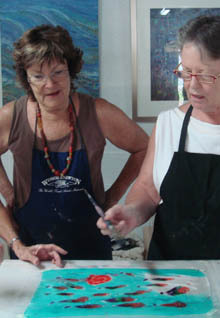 Strong participation in lithography, lino printing and etching classes, held by Theo Tremblay in his Canopy studio in Cairns, augurs well for printmaking in the region. 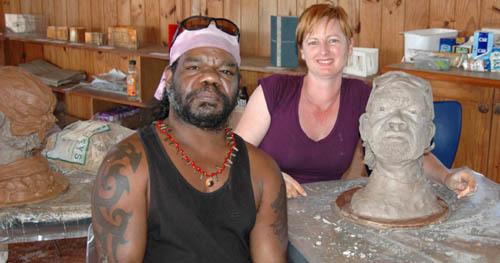 Would you like to try your hand at making life-sized clay sculpture portraits? Learn oil painting techniques? 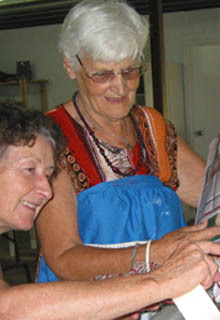 Or learn silk painting as you make yourself some very wearable art? 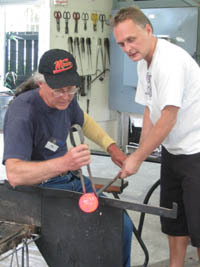 How about learning how to slump and fuse glass in which to embed your special images and feelings? Or make jewellery from glass? For that matter, how would you like to make your own sparkling clear glass from sand? 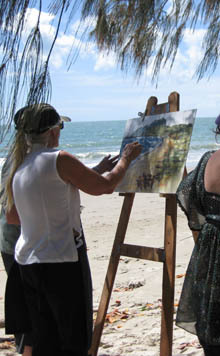 Most art groups organise life drawing classes from time-to-time, sometimes dependent on the availability of a model. This is when it is really useful to have studied, at least elementary, anatomy of the skeleton and muscles! 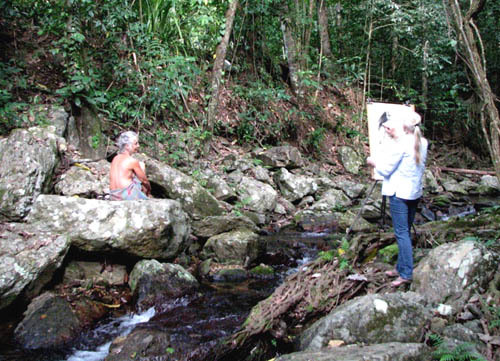 Life drawing session in a rainforest creek - develop the artwork into a narrative? 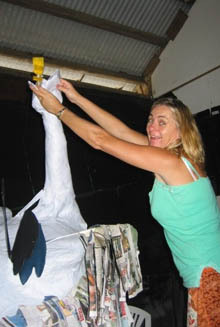 See what Artquest Port Douglas has in store for you or check out Go Troppo Arts Festival workshops. If you would like to list your whole creative arts workshops programme for 2013 on this site for a very minimal charge, please let me know via the form below. You may list individual workshops here - free of charge. "Hmm - now what shall I do next?" Working together - "Now, what will happen if we put this here?"